Looking at the recent evolution of oil production in the Lower 48 states (excl. 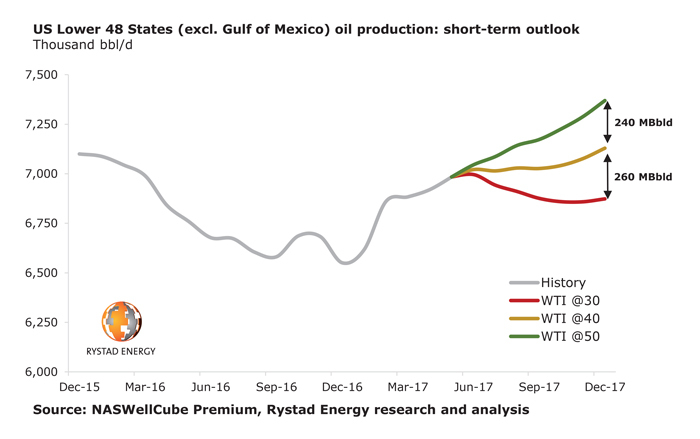 Gulf of Mexico), Rystad Energy observes a continuous expansion, with a 430 MBbld growth from December 2016 to May 2017. Even though late-2016 production levels were adversely exposed to winter storms in several states, the growth from the average level in 4Q 2016 to May 2017 is still significant, around 340 MBbld. The majority of shale-dedicated operators were able to achieve oil production levels around the high-end of guidance in Q1 2017 or beat it on several occasions. Despite growing concerns about service cost inflation in the most active basins, completion activity is set for a steep expansion throughout the remainder of 2017. US Lower 48 oil production is set to expand by an additional 390 MBbld from May 2017 to December 2017 assuming a WTI price of 50 USD/bbl. The recovery in rig counts has been outpacing the growth in completion activity since 2H 2016, resulting in a strong build-up of new high-quality inventory of drilled uncompleted wells (DUCs). Should the prices collapse to 40 or even 30 USD/bbl level, a major part of these DUCs can still be completed commercially given that drilling costs are sunk. Therefore, a drastic downward shift in the market conditions will not lead to a rapid collapse of the U.S. oil production. No more than 500 MBbld of December 2017 volumes are at risk in the 30 USD/bbl scenario. Historical NAm well data based on state/governmental sources, incl. production, completion data, well curves & curve fitting, as well as production and activity forecast & costs and breakeven prices per well.